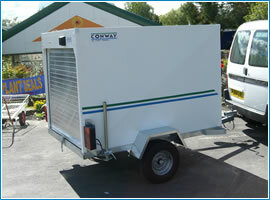 Security and good looks are paramount with Conway’s range of lightweight van trailers. All equipment being carried inside the trailer is hidden from view and the compact size of the range enables it to be conveniently parked within a normal domestic garage for added security when not in use. 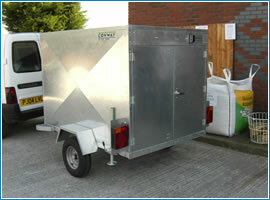 Galvanised Chassis and galvanised sides make the trailer extremly durable. Easily towed by most vehicles ranging from the average family car to the latest ‘people carriers’, taxis or private hire minibuses, all the range are fully enclosed capable of carrying up to 630kg, making them ideal for those instances where a full size van trailer is not required. 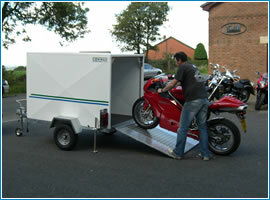 A lightweight van trailer with a steel preformed body which is strong, lightweight and reduces road vibration. Sides manufactured from galvanised steel. 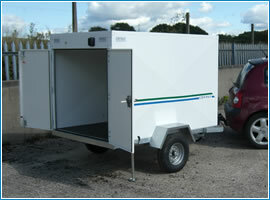 Galv double door to give easy access and utilising the maximum width & height of the trailer. Phenol coated hard wearing plywood floor. Jockey wheel for easy manoeuvrability as standard. Rear drop legs for stability when loading as standard. Can easily be towed by an average family car. Also available in the lightweight range are the VT 757 TWIN Axle Unbraked and the VT 1300 TWIN Axle Braked. Contact us for details.